The year is 2032. Tokyo is all but completely controlled by the vast GENOM Corporation, and rogue robots called boomers wreak havoc on the streets. With the police and military unable or unwilling to face these threats, a crew of four power-armored vigilantes takes on GENOM and its lethal creations. They are the Knight Sabers, and these are their stories. 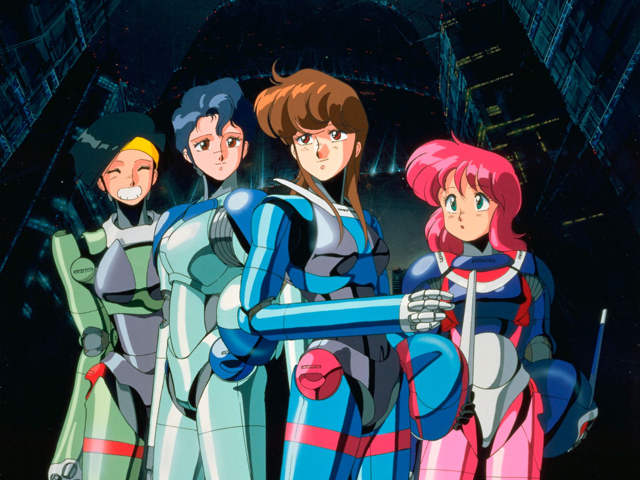 I first saw Bubblegum Crisis many years ago, back when my primary options for finding anime were the Scifi Channel and the Action Channel. It was one of my earlier exposures to the art form, so I freely admit that I have a lot of nostalgia for it. Rewatching it recently, the show holds up fairly well in a lot of respects. While far from perfect, there is a definite charm to it that is hard to deny. A few notes about the series before we begin: Bubblegum Crisis was planned to run 13 episodes of varying length, but was cut to 8 due to legal issues between its two controlling studios. The episodes that were produced were overseen by 3 different directors, and it shows in a somewhat inconsistent tone and writing style. 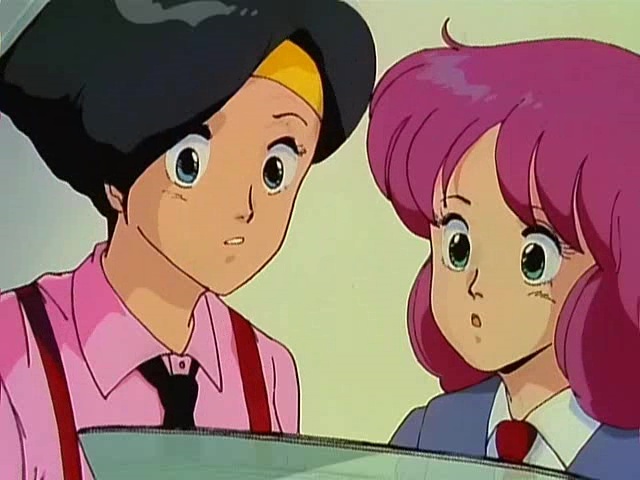 The series is also part of a larger media franchise that includes AD Police Files, Bubblegum Crash, the 1998 remake Bubblegum Crisis 2040, and the spin-off Parasite Dolls. The original series doesn’t require any knowledge of the other shows to follow, but you may wish to look into them if you enjoy it. Oh yeah, them’s the 80s, all right! Crisis takes place in Tokyo in the years following a major earthquake, and the first episode shows the dramatic split between the middle/upper classes and those who live on the wrong side of the tracks. The monolithic GENOM Tower dominates the skyline above dazzling high-rises and wealthy shops. Away from the glitz, we see a darker, drearier world. Crime and homelessness are rampant, and it’s obvious that this is a nasty and divided future. In the midst of all of this, we are thrown into a live rock concert with lots of big hair, stockings and leather, proving that the future will be just like the 80s, only harder. This is intercut with scenes of the police struggling to contain a rogue military boomer as it cuts a swath of destruction through the city. 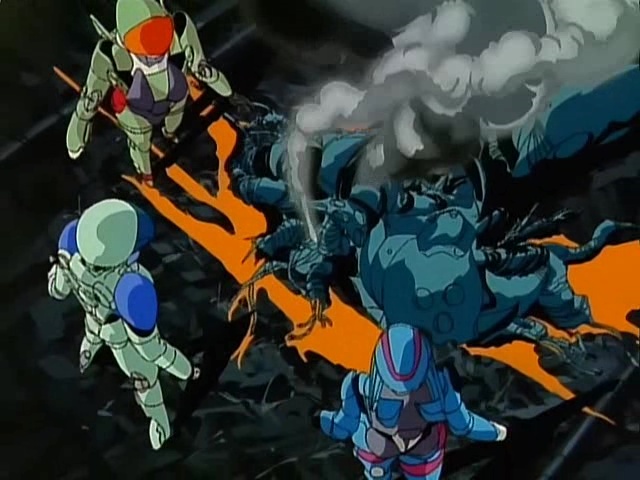 Cars and helicopters are blasted apart and the rampage continues until the Knight Sabers, a quartet of women in powered hardsuits, arrive to save the day. The whole affair is accompanied by some great examples of contemporary music, and sets the tone for the majority of the series. The show follows the Knight Sabers on their various adventures, mostly fighting against GENOM and the deadly experimental boomers it creates. Most of the episodes are fairly self-contained and focus on one particular incident or mission, which is usually wrapped up by the end. This gives each story a nice sense of closure, but it becomes obvious before too long that the protagonists don’t make a lot of genuine progress in their overall goal of facing down GENOM. On the positive side, several episodes plant the seeds for later storylines, so there is a good deal of continuity and consequences for the heroines’ actions. The writing is hardly nuanced, as GENOM is pretty much the archetypal evil mega-corporation of 80s/90s pop culture, so don’t go in expecting lots of depth or philosophical exploration that you might find in more ‘cerebral’ fare like Ghost in the Shell. Most episodes of Crisis are more about the characters and setting, and how they are affected by GENOM’s machinations. 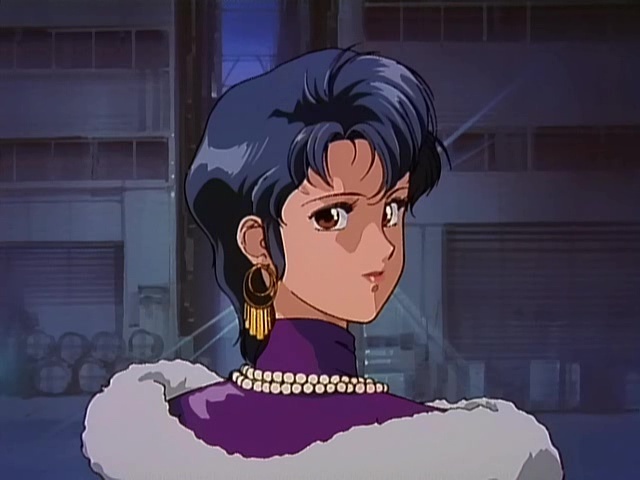 The characters in Bubblegum Crisis are a bit of a mixed bag. Like the plot, they are not particularly complex, but most of them are well-rounded enough that I enjoy watching them. Even if the story is a little shaky sometimes, I find that there’s a lot to enjoy in how the characters interact and what they are like when not on the job. 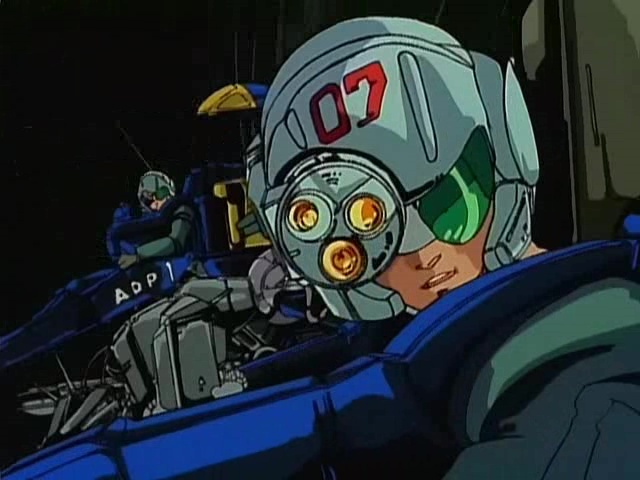 They are also designed by Kenichi Sonoda, the same fellow who created Gunsmith Cats (another of my favorite action OVAs), which adds another layer of enjoyment, at least for me personally. Priss is the quintessential 80s tough girl; a punk rocker by night, and a motorcycle riding, power-armored vigilante… also by night. While she can be headstrong and abrasive, she doesn’t come across as the needlessly violent action chick that has long been shorthand for the “strong, independent woman”. Her altruistic side and the inclusion of her music career give her a lot more depth and personality than any token tragic backstory. 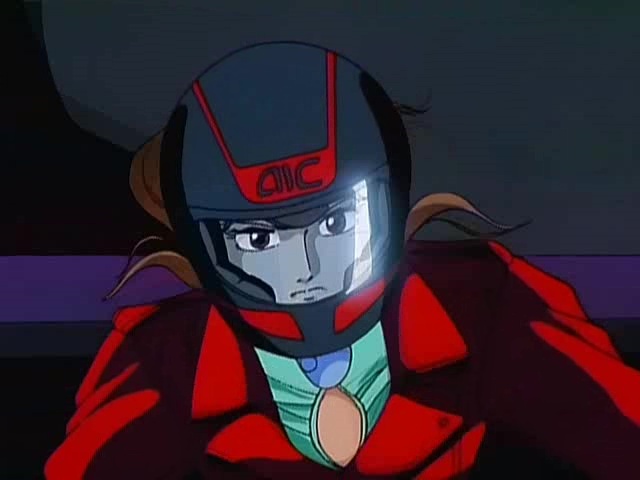 Rewatching the show, it made me a little sad to think that the biker girl archetype has mostly disappeared from modern anime, and media in general. The leader of the Knight Sabers is Sylia Stingray. While her leadership is more often implied than seen, she does a good job of balancing the team’s personalities and makes good use of her contacts to keep tabs on GENOM. It’s clear from various flashbacks that her family’s history with the company was supposed to be a major part of the plot, but sadly, this doesn’t get much play in the truncated series. In spite of that, I’m a big fan of her character design, and it’s hard to find a better combination of competence, compassion and class. Shockingly enough, the fact that she owns a lingerie shop is not used as an excuse for regular fanservice. Finally, the team is rounded out by Linna and Nene, the two junior members. Linna is pretty unremarkable, though she does play a crucial role in several episodes, both in and out of combat. Like the others, she also has a day job, this time as an aerobics instructor. If movies and TV from 80s are any indication, at least 50% of every woman’s time was spent in one of those classes. Nene, on the other hand, is a member of the AD Police, and uses her inside info to help the team. In battle, she plays more of a support role, but her data analysis is often crucial to winning the fight. The whole team synergizes remarkably well, and everyone gets their time in the spotlight across the various episodes. The supporting cast does bear mentioning as well, though most of them are far less developed than the Knight Sabers. The girls often cross paths with Leon McNichol, a brash but honest member of the AD Police anti-boomer division. He admires the work they do, and is even able to help them out a few times. His partner Daley gets less screentime, but is one of the better representations of gay men in anime, especially for the era. The two have a fun buddy-cop chemistry that adds a touch of humor to the more overall serious tone of the show. Sadly, the bulk of the show’s recurring villains provide a lot less to go on, and are mostly a series of rich dudes in business suits working for GENOM. A few of the one-shot antagonists are more unique and interesting, like a man who hunts down biker gangs while cybernetically linked to his customized sports car. That particular plotline is every bit as cheesy and bizarre as it sounds, but it’s still a good bit of fun to watch. All-in-all though, most of the villains are just power-hungry corporate dudes who are evil for its own sake, and while it’s satisfying to see them taken down, there’s not a lot of meat to them, story-wise. While the characters are mostly enjoyable, there are other parts of the show that may put some people off. Despite the art direction being quite good, the animation in the early episodes can be pretty choppy. Things improve significantly as the show progresses, but sharp-eyed viewers will probably notice a few annoying errors. Sylia’s pervy younger brother is another element that makes me cringe, though he’s less outright creepy as the series carries on. What doesn’t really improve throughout the show is the quality of the dramatic writing. The dialog is decent for the most part, but major plot points or dramatic moments are often accompanied by overblown or contrived exclamations. These melodramatic scenes can get tiresome, especially when you’ve seen at least three characters expire tearfully in the arms of a distraught friend. These scenes are even harder to take seriously in English, where the voice direction often barely matches the events on screen. If you’ve got the stomach for it, the cheesiness alone can be entertaining, but don’t be surprised if it yanks you out of the story somewhat. Overall, the two things that I enjoy the most are the setting and the mechanical designs.The show revels in its decidedly 80s cyberpunk aesthetic, where power armor and orbital laser cannons exist, but people get paper printouts of the news every morning and cell phones were never invented. The series feels both futuristic and antiquated at the same time, and bears a decidedly Western influence. References to Blade Runner and the 1984 ‘rock and roll fable’ Streets of Fire are sprinkled throughout, most noticeably in the first episode’s opening. Even the overarching story, about a team of vigilantes from all walks of life taking on an evil mega-corp, has a very American feel to it, which is something rarely seen these days. Side Note: Seriously, you should all watch Streets of Fire. That movie is absolutely bananas, has some amazingly 80s music, and contains a young Willem Dafoe dressed like the lead singer of Rammstein. I cannot make this stuff up. Along with the setting, the mechanical designs for the show are pretty fantastic. 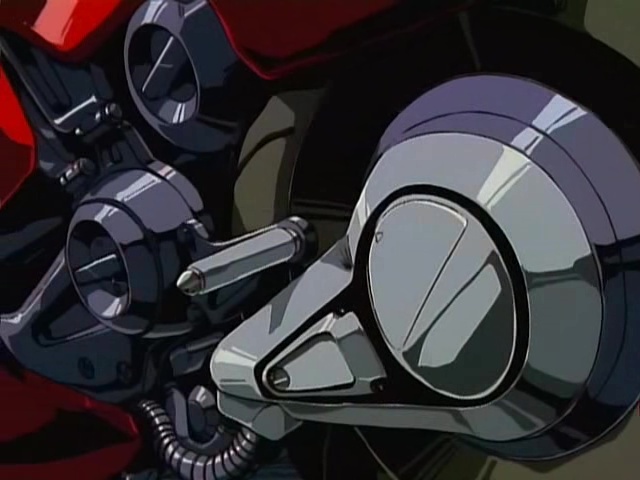 There is an almost pornographic level of detail given to several of the bikes, mechs and other vehicles, some of which only appear for a single episode, or even a single scene. A lot of the GENOM tech shares a rounded, almost organic form, while the military and police use more angular, boxy equipment. Everything looks like it has serious mass to it, and it’s all highlighting in the harsh shadows/reflective gleam that often appears in anime of the era. The Knight Sabers stand out from both of these with slim, lightweight and very obviously feminine suits. I’m not going to defend the built-in high heels, but I do think that the system for putting on the armor, stepping into the unfolded legs and then clamping the front and back torso sections together, is well thought-out and cool to see. It’s also nice to see suits that are clearly designed with protection and firepower in mind when so many modern anime throw their female fighters into armor that wouldn’t protect you from an autumn breeze. Lastly, I need to take a moment to talk about the music in the show. 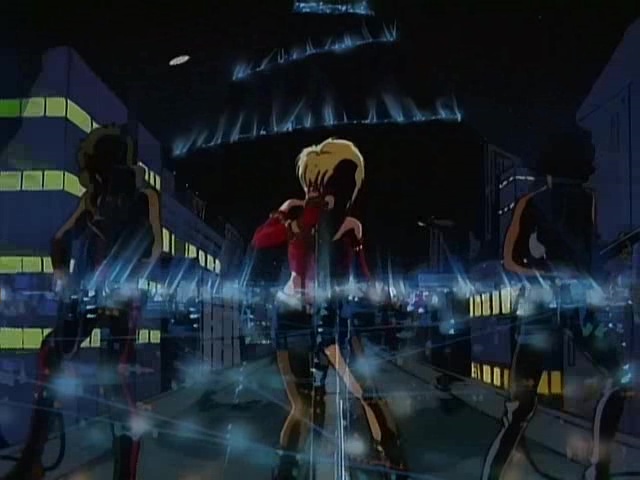 Rather than having a traditional opening and ending sequence, each episode Bubblegum Crisis features one or more unique, vocalized theme songs. While they vary somewhat in quality and connectivity to the scenes they’re featured in, there is an undeniable charm to them that I enjoyed. Konya wa Hurricane is still one of my favorite anime songs of all time, and the other tunes are plenty of fun to listen to if you enjoy Japanese music from before the modern J-pop wave crushed all in its path. Rather unusually, the English release of the show rewrote and redubbed every single one of those songs. While the results aren’t particularly good, that’s a level of dedication you don’t see often enough anymore. Would you ever see the entire vocal soundtrack to a half-finished OVA fully translated and performed in this day and age? I sincerely doubt it. 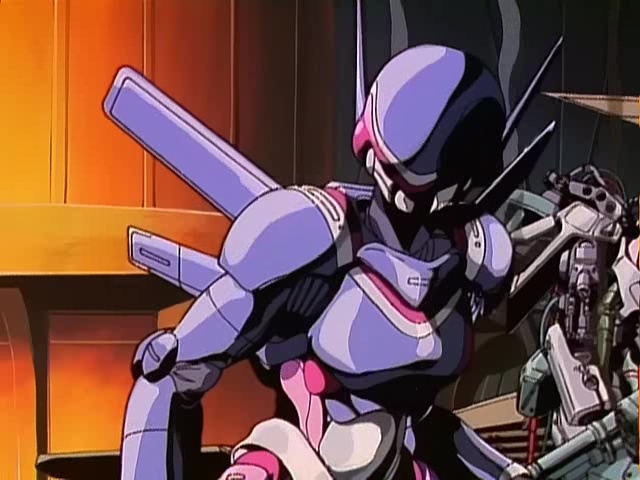 In spite of my own nostalgia, I realize that there is a lot wrong with Bubblegum Crisis. The story is wonky, the dialog sometimes stilted, and the lack of a satisfying conclusion can be a huge turn-off. That being said, it has some good action scenes, a strong central cast, and wonderful mechanical designs. The music is definitely niche, but you’ll be hard-pressed to find better examples of such quintessentially 80s anime tunes. If you enjoy cyberpunk anime, or want to catch a glimpse of what animators of the 80s thought the future would hold, you could certainly do a lot worse. So bust out your leotards, mainline the original Terminator, and crank up some Pat Benatar, because it’s time to revel in a decade half of us don’t even remember!